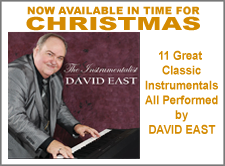 David East developed his love for music at the age of 8 years old, singing in his home church and at school functions. This love for music led him to first learn to play the guitar, taking weekly lessons for a year and eventually increasing his ability through self-instruction and study. Early in his life, David exhibited a strong ear for music, excelling in both instrumental and vocal performance. David has learned to play a total of 13 instruments, but he’s best known for is his piano and keyboard work. Always a fan favorite, once the big man gets behind the piano you know that you’re in for a wealth of good music and entertainment. His playing is a mixture of several different styles presented with his own flair. When you listen you can hear the influences of Jimmy Swaggart, Jerry Lee Lewis, Floyd Cramer, Bruce Hornsby, Billy Joel, Hargus “Pig” Robbins, and others. Do you want updates delivered directly to your doorstep? Sign up for our newsletter!